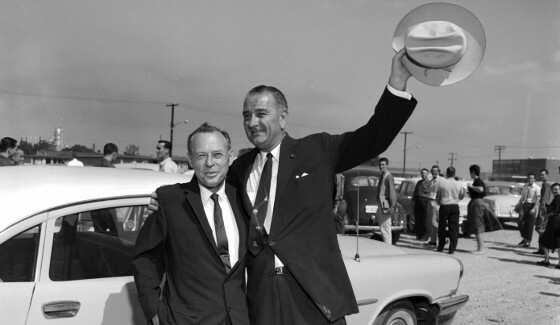 Senator Lyndon B. Johnson, shown with Lamar's president, F.L. McDonald, gives the crowd a Texas size greeting during a visit to Lamar in 1959. 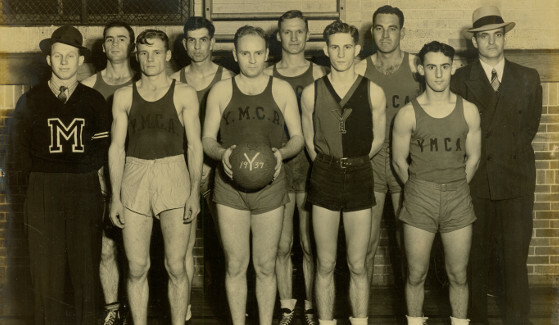 Beaumont YMCA Basketball Team. They were National League Champions in the YMCA Basketball League. 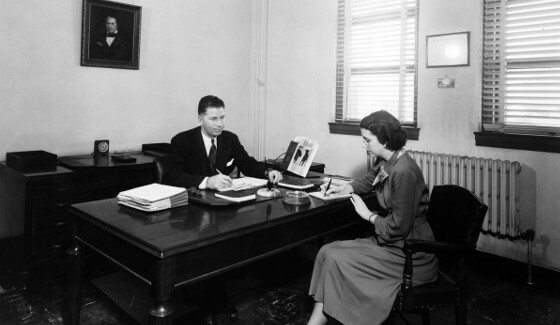 President John Gray's office in the early 1940s. 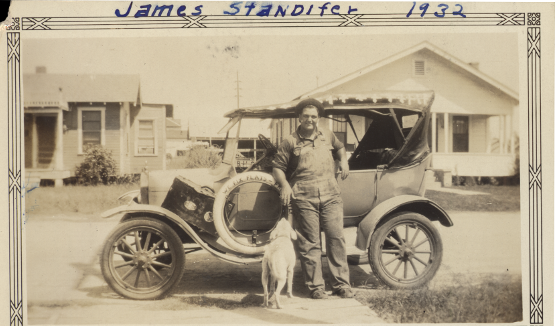 James "Tiny" Standifer leaving for college, September 1932. Standifer was a coach at Lamar in the early 1940s. 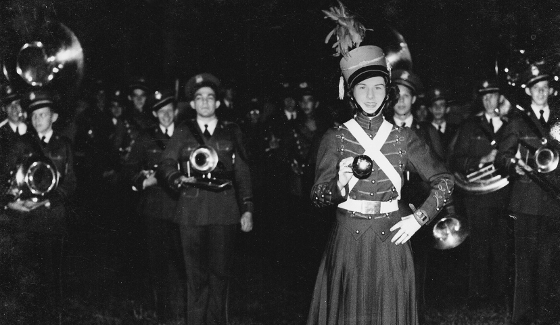 Bonnie Combs, Lamar's drum major during the 1935-1936 football season. 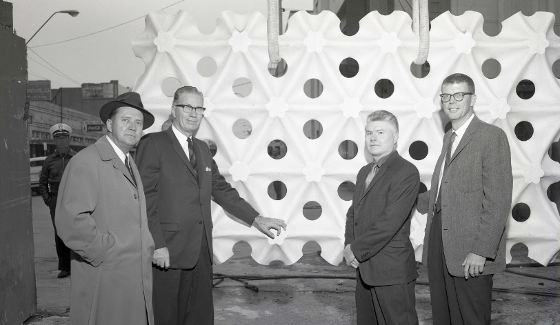 A solar screen installed during the First Security National Bank construction in downtown Beaumont 1963. Pictured are L.W. Pitts, building architect; John Gray, bank president; Herring Coe, Lamar alumnus and sculptor of the screen and many other works; Douglas E. Steinman, building engineer. Larry Jene Fisher was born on June 18, 1902 near Wichita Falls, Texas. Fisher was truly a Renaissance man as he was an aviator, musician, photographer, playwright and filmmaker. He played a key role in the first movement to preserve the Big Thicket as a national park by photographing Big Thicket flora and fauna. Mildred Ella Didrikson was born on June 26, 1914 in Port Arthur, Texas. 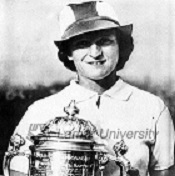 The United States Sports Academy's Mildred "Babe" Didrikson Zaharias Courage Award is given to "an individual who demonstrates courageous action in overcoming adversity to excel in sport." Nothing could better describe the life of Babe Didrikson Zaharias. Lamar's school newspapers, dating from 1933-2005, are now digitized and available here! Check us out on the Portal to Texas History.